JPEG、MP1、MP2、MP3、MP4、VOB& #12289;WMA、AVI、DIVX etc. 7) Memory Card: SD/MS/MMC/CF/XD USB interface: High speed 2.0 8) Supporting calendar, clock, alarm clock, time-switch machine. 9) Image-displayed mode: slideshow,step show, preview , zoom, rotate,play function . 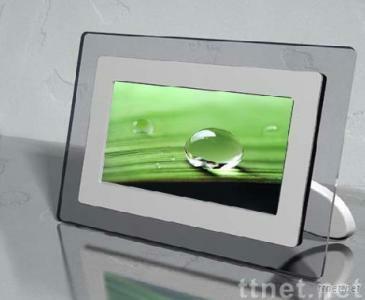 10)Adjustable slideshow speed (5sec,10sec,30sec,1 Hour) and display mode. 11)Adjustable brightness, contrast, color, 14 kinds of transition style. 12)Built-in stereo speaker (2x2W) and earphone 13)Operating System:OSD(On Screen Display) and Remote Controller language: English/French/German/Italain/Spanish/Portuguese/Dutch video output 16)Different country adapter (9V DC,100V-240V AC) for your choice.